Aristolochia, with about 550 recognized species, is a predominantly tropical and subtropical genus that extends to the Mediterranean and temperate zones worldwide. 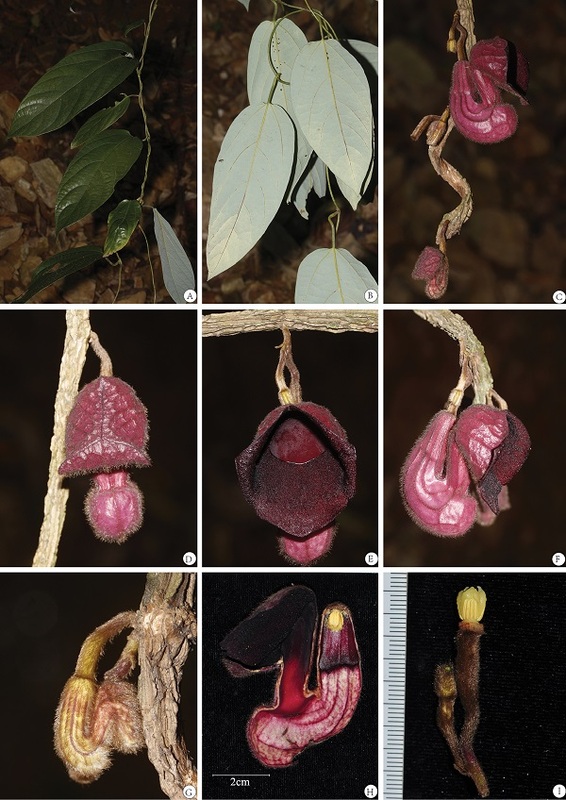 During a field expedition to Putao, Kachin state, north Myanmar, researchers from Xishuangbanna Tropical Botanical Garden (XTBG) collected an unknown species of Aristolochia. After careful studies of the genus, particularly the floral characteristics of those species in the adjacent regions, as well as comparison between this unknown species and its related species, the researchers confirmed that this species is new to science. They named it as Aristolochia sinoburmanica and got it published in PhytoKeys. Aristolochia sinoburmanica is a perennial woody liana which grows under the montane broadleaf forests, at an elevation of about 900–1400 meters. It has strongly curved perianth, 3-lobed limb, as well as 3-lobed gynostemium. Its leaf blade is ovate or ovate-lanceolate to narrowly ovate. Its base is rounded to slightly cordate and its tube horseshoe-shaped, with visible dark purple veins. Aristolochia sinoburmanica is morphologically similar to A. faviogonzalezii, A. hainanensis, A. tonkinensis, A.saccata and A. xuanlienensis. However, the new species differs from the aforementioned species in several important vegetative and reproductive characters. The species epithet sinoburmanica refers to the type locality in Myanmar and adjacent regions of China. It also shows that the two countries are friendly neighbours, their friendship being retained over a long period and also expresses the researchers’ appreciation for the whole-hearted cooperation amongst members of the China-Myanmar joint expedition. Since very few details exist about its natural distribution, it doesn’t allow a final risk evaluation and the species might be regarded as data deficient (DD). Aristolochia sinoburmanica Y.H.Tan & B.Yang, sp. nov. A young branch and adaxial leaf B young branch and abaxial leaf C cymes on old woody stems D front view of preanthesis flower E front view of open flower F lateral view of open flower G lateral view of young flower H longitudinal section of flower I gynostemium, ovary and pedicel. (Photographed by Y. H. Tan, H. B. Ding & B. Yang).